Emerging technologies in Immersive learning, like Second Life, afford us significant opportunities to explore new mechanisms for educational interaction, but they also present us with a wealth of new challenges. A common theme with the adoption of such technologies is that we are recycling older technologies rather than genuinely leveraging the tools and resources exposed by the new technology. This panel is composed of people who have been confronting this challenge, and working diligently to embrace both the new immersive learning technology and to fully utilize the new features and facilities inherent in those technologies. I always find it highly inspirational to hear other instructional designers talk about their approach and their theoretical foundations, and a couple of things struck me in this. First of all there seems to be growing consensus on using the term “immersive” to describe the main affordance of technology/media like Second Life. I understand the need to distinguish Second Life from other types of virtual teaching and learning environments, but I find the use of “immersive” somewhat problematic. If by “immersive” we simply refer to a sense of “being in a place” as opposed to the less concrete “space” concept, I agree that virtual worlds like Second Life can promote this sense, but it is only a potential, not a given. I’ve had students in all my in-world courses that didn’t feel immersed at all, but this is also a matter of how you define “immersive” and something I’ll return to in later posts. Secondly, I agree with the panel that there are two major strategies for the technology/media adoption namely “recycling” and “genuine leveraging the new affordances” – two strategies that I refer to as respectful vs. radical remediation and have incorporated in my model for 3D-remediation of people, places and practices. When describing their work the panel referred to the ADDIE model, one of the most common instructional design models that resembles the classic Action Research cycle of planning, acting, observing and reflecting – especially if continual feedback is applied i.e. through the use of RAD. After I started writing this post my Mac broke down again – this time apparently for good – and sadly I hadn’t taken any backup of my vwbpe-photos or notes, so the rest of this will be based on memory (hence the ‘ish in the title). The next event “Learning in 3D: A New Educational Dimension” with Abbott Bundy & Wada Trip was something I had been really looking forward to. When I did my first lecture on SL back in the fall 2007 I relied heavily on the work – primarily blog postings – of both Abbott & Wada and I’ve been following them on a regular basis ever since. Based on the abstract for the session it was clear that they would talk about their book “Learning in 3D. Adding a New Dimension to Enterprise Learning and Collaboration”, and since I haven’t read it, I found it quite interesting – the session is archived here on Treet.tv. 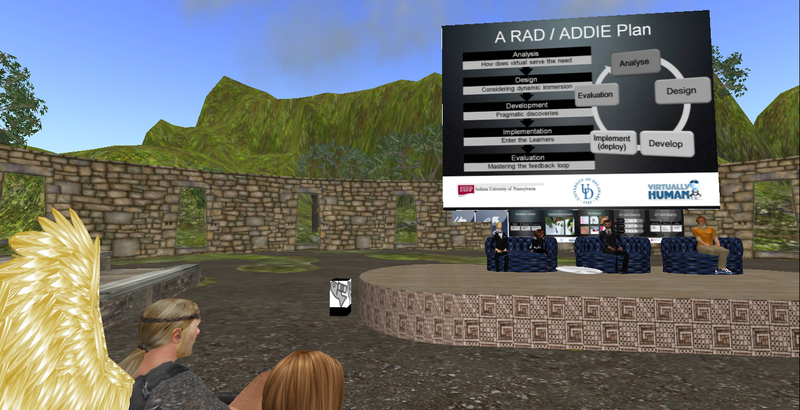 Another much anticipated session was conducted by my two friends Chimera Cosmos & Spiral Theas, who presented their work with “Learning in a Virtual World: Using SL for Medical Education” – slides can be found here. There’s also a recording of the session here, but as you can hear the sound wasn’t terrific, especially Spiral’s voice was breaking up. 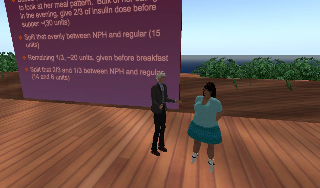 Based on a pilot study on Continuing Medical Education, that they did together with colleagues and 14 participant family practice physicians (described in an article here) Chimera & Spiral presented some interesting results and also showed us how they had been experimenting with the use of mock avatars in role-playing. At a certain point Chimera logged in (via another computer) as the diabetic patient, Mariana Hexicola and started communicating with the audience. From the post Spiral wrote afterwards it was evident that they deliberately wanted to show, not just talk about, the things they had implemented in the pilot study. 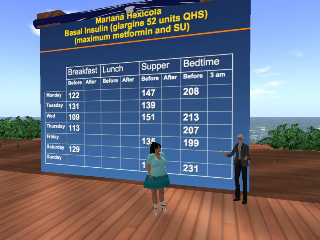 Pictures kindly provided by Spiral show the overweight, diabetic patient, Mariana interacting with the Professor as part of the pilot study. The study proved some highly interesting results with participant improvement in clinical skills, but what also was fascinating, was the participants’ rating of the experience in SL as they all agreed that the experience was superior to other online methods, and the majority felt that the SL method was as good as, if not better than, f2f methods. Having read the above mentioned article, I’m quite sure that the success stems from a very deliberate instructional design strategy, which addressed the participants’ needs not only as learners of a particular subject matter, but also as users of SL. Even though it is a small study, I think it supports the growing body of studies done by especially natural scientists in virtual worlds very nicely, and the article is well worth a read even for educators in other fields. After this, the next session I wanted to attend was on “Creating a Positive First Hour Experience“, which of course is highly relevant, but as the presenter decided to do his session in text only, I decided to skip it. SL simply doesn’t appeal to me without voice … I might as well read a regular text in my own pace. Instead I decided to get some sleep before attending the last session (at 5 am in Denmark), which was by another friend of mine, Tab Scott who has been actively teaching and researching in SL since 2005. RL Tab is Director of Creative Research Lab at Montana State University and Tab presented some of the many projects the lab has been involved in since 2005 and also gave some hints as to where they are heading in the future – there’s a recording of the session here. A central keyword of the CRLab is collaboration, and when Tab first entered SL is was to investigate whether SL could be used as an environment to support collaboration, and well they’ve been using it in teaching architecture and arts classes successfully ever since. One of the many things I appreciate about Tab’s philosophy and approach to using SL is that he doesn’t see it as a stand-alone technology. Now, first of all there’s a very pragmatic reason for that, namely the stability of the environment. As Tab mentioned using SL back in 2005 (and even when I entered in 2007) could be really frustrating due to technical issues, constant updates of the viewer, maintenance etc. The stability of SL has improved a lot, but there still is a risk that you or your students will have technical problems, so a backup plan is highly recommendable. (i.e. Chimera and Spiral had Skype as backup as part of their instructional design). But I think a more appealing reason for not using SL alone stems from the fact that even though the core of the environment is 3D, the more interesting uses (naturally depending on your goals) often come when combing it with other 2D technologies such as SNS, shared documents and streamed media and at the CRLab they work with the concept of PLE’s thus trying to ensure that the students become media literate in a broader sense. Given that most new users find the learning curve in SL pretty steep, I think it makes perfect sense to include some more familiar technologies that also can help reduce the alienation some new users experience. At the CRLab collaboration goes way beyond university and even state and county boarders, and another of Tab’s points was that we as in-world educators need to help each other validate the use of SL. I agree and I think that even though educators have been tirelessly using SL for many years now, it still is an emerging technology and in my point of view we have yet to pass the early adopter phase. Someone in the audience, who had been using SL for three years, mentioned that his problem wasn’t to get the students to use SL, but rather the rest of the faculty – and this is definitely something I can relate to. Wonderful summary, Mariis! Thanks so much for this. Like you, I was disappointed to have missed so many sessions (just like in RL conferences), but reading your summaries here, helped to make up for that. I particularly appreciated your comments and added insights – completely agree about the wisdom of using some other, more familiar technologies along with SL and I too have some qualms about the use of the term “immersive”. And thanks so much for the insightful summary of our session at VWPBE. Ditto on what Spiral said! Thanks so much for coming to our session and for your thoughtful comments. Designing these experiences pedagogically to take advantage of the virtual environment and continuing to work on the best ways to acclimate newcomers are both turning out to be fascinating activities. I hope to have many more opportunities to discuss and collaborate with both of you far into the future.